So, how do you boil an egg? There are two types of boiled eggs, hard boiled and soft boiled. Hard boiled eggs, or hard cooked eggs, are cooked thoroughly, until the yolk is firm and, ideally, a uniform bright yellow in color. Dark yellow yolk centers mean the egg is a bit undercooked, green yolk exteriors and a ping pong ball like texture mean the egg has been overcooked. It's best to cook eggs of uniform size if possible, so they are done at the same time. If I have a few large eggs (common with ungraded eggs from the farm), I'll lean towards having those slightly underdone, rather than overcooking the smaller eggs to get the large ones more done. Soft boiled eggs, also called coddled eggs, are lightly cooked, so that the yolk is soft and runny. The white is commonly less firm as well, which is why a soft boiled egg is commonly eaten directly from the shell with a spoon. This post focuses primarily on hard boiled eggs, as those seem to be more commonly consumed and more difficult for people to prepare. Begin the egg boiling process with older eggs, preferably at least a week old. If you're using store eggs, this probably isn't a primary concern, but if you're trying to cook your farm fresh eggs, you'll want to take note of this. Why? Inside the egg are two membranes, just under the shell, an inner and an outer membrane. Between them is an air pocket. As the egg ages, this air pocket gets bigger (the egg loses water, since the shell is permeable, and draws in air). This enlarged air pocket makes peeling the egg easier. The membrane seems to adhere less strongly to the egg as well. Full details about egg anatomy can be found here. Starting with eggs at room temperature will help prevent cracking and blow outs. You may start with cold or boiling water – your choice. I usually start with normal tap water temperatures and eggs right out of the refrigerator, as I don't often plan ahead for eggs. 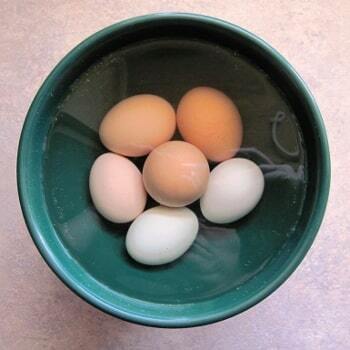 Cover eggs completely with water. Use a pan large enough so that the eggs are not packed together, but not so large that you're heating up more water than you really need. Adding a teaspoon of baking soda to your cooking water will help fresh eggs peel easier. Quickest way to hard cook eggs: With room temperature and cold eggs, bring eggs to a moderate boil (constant bubbling, but not looking like the water will erupt from the pan). Hold at moderate boil for seven minutes for large eggs (extra large/jumbo may take 8-9 minutes, small/medium 5-6 minutes). Boiling water start to hard cook eggs: Bring water to full boil in pan. With a spoon, carefully lower eggs into boiling water (this is where eggs usually get dropped and cracked – take it easy). Reduce heat, simmer for 18-20 minutes. Energy saving way to hard cook eggs: Start with room temperature water and eggs, heat until boiling. Remove from heat. Cover and let stand off heat for 15 minutes. Cold water start to soft cook eggs: With room temperature and cold eggs, bring eggs to a moderate boil (constant bubbling, but not looking like the water will erupt from the pan). Remove from heat, cover. Let stand off heat for 2 to 4 minutes. Boiling water start to soft cook eggs: Bring water to full boil in pan. With a spoon, carefully lower eggs into boiling water (this is where eggs usually get dropped and cracked – take it easy). Reduce heat, simmer for 3-5 minutes. Use a kitchen timer when you are boiling eggs! Seriously, this is the main “secret” to perfectly cooked eggs. If you want to get fancy, there are egg timers that you can put right in the water that change color to show when the eggs are done, but I haven't tried these yet. If you eat a lot of soft cooked eggs, there are some super cute egg cups available. Some of my favorites from Amazon have little chickens on them. They have egg toppers, too, which neatly remove the tops of the eggs without making a mess. 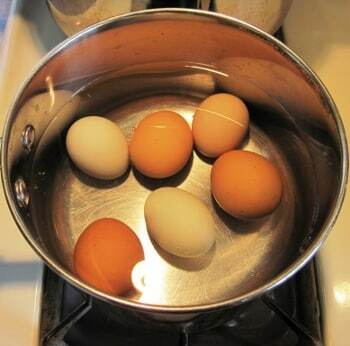 Once your cooking time is finished, place the eggs into cold water to “shock” them and stop the cooking. Ice water is great, but cold tap water will do just fine. (Coddled eggs can go right to the table at this point.) I don't just drain and rinse my eggs, because I have heavy bottomed pots that hold the heat. It's worth it to get out another container to drop the temperature quickly. Once your eggs are cool enough to handle, tap each end firmly against the counter, then gently roll them on the counter to get an evenly cracked surface. This should allow you to identify the air pocket near the tip of the egg by the indentation at that end. Starting at the air pocket end, gently peel back the shell. It's best to work quickly, because the cooler the egg gets, the more the membrane will want to stick to the egg white. 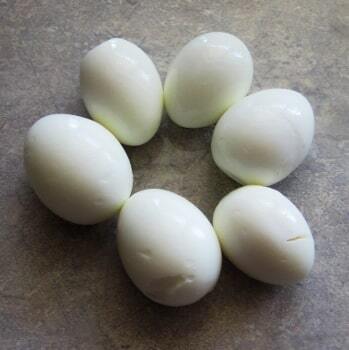 I'm not sure if commercially prepared boiled eggs in the shell use really old eggs or perhaps add baking soda to the cooking water, but I've found I get the best results when I peel the eggs when they are still warm. The shell should come off fairly easily, often in large strips (see below). Peeling under cold running water can also help to loosen the shell. Ta-da! 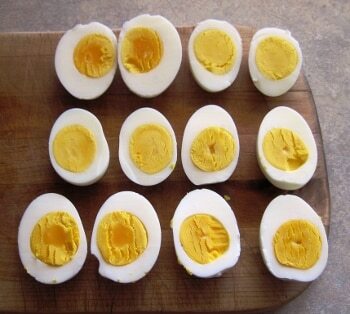 Neat and tidy boiled eggs with only minor imperfections (these could have been a little older). Upon slicing, you can see that the large eggs are a hair underdone, but I prefer that over overcooked. These eggs were cooked for seven minutes starting from the fridge in room temperature water. The largest ones are probably extra large or jumbo (they were ungraded). Use a sharp knife or an egg slicer for easier cutting. If you're feeling a little adventurous, check out this video about how to peel an egg – without peeling an egg. I haven't tried it yet, but it looks pretty cool. Language warning: the guy in the video notes that peeling eggs can be a pain in the *ss. 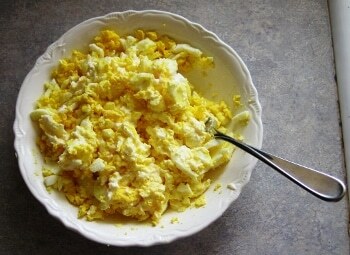 I mashed these up to make a simple egg salad with the addition of some mayonnaise and a little paprika and pepper. You can also add pickle relish or finely chopped celery. Get creative! We eat this with sourdough bread or crackers, or sometimes veggie chips. I love the deep yellow color of the farm eggs versus how pale store eggs usually are. Of course, good eggs are pretty darn tasty just on their own with a sprinkle of sea salt and pepper. Try out some of the “funky” colored salts from Frontier if you want to be adventurous. Personally, I do taste a difference between black lava salt, pink Himalayan salt, grey sea salt and the others. They seem to taste more salty then regular table salt, meaning I can use less to get the same amount of flavor. So that's my take on how to boil eggs. Do you have any tips or recipes you'd like to share? Boiled eggs are a summer favorite in our house when eggs are abundant, because they cook so quickly and easily. 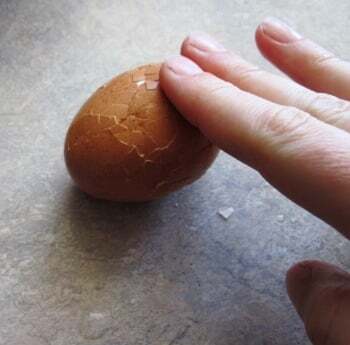 Paths of Wrighteousness has a special method for cooking very fresh eggs: She pokes a hole in each end of the egg, just through the shell, not through the membrane. She brings her water to a boil, lowers the eggs gently into the water, and boils for 16 minutes. At that point, they are drained and placed in an ice water bath and allowed to chill for 15 minutes before peeling. I have not tried this, because I purposely age my eggs a bit for boiling and it seems like a bit more fussing, but her eggs look great so I'd say that it probably works. Another site (Sorry! Can't remember where I saw it.) 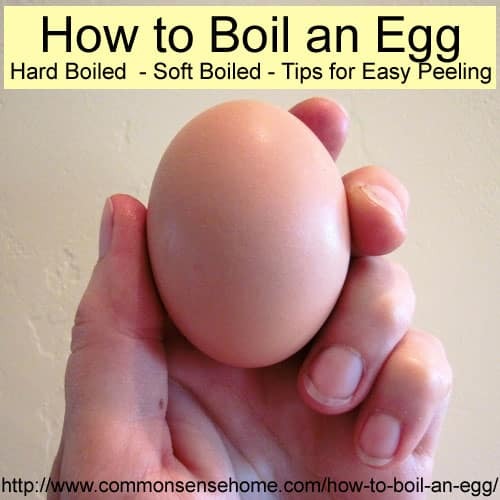 suggests boiling as normal, then an ice bath, then dipping the eggs one by one in boiling water for a few seconds (to expand the shell back out) and peeling immediately. Excellent instructions! Every college student should read this post :). Thanks for visiting my blog – and for the recipe recommendation. I don't believe I've made that one. I was wondering if I can use the water I boil my eggs in for my water kefir. I boil the water I use in my kefir anyway and I figured it'd be great if I could do both at the same time. I heard of putting shells in the water so I was thinking this might be a possibility. Any thoughts? It took me a LONG TIME to learn this! Beautiful Blog! Awesome advice! Nice post. I've read a lot of egg boiling posts myself as I was working on figuring it out and will post on it as well. I have a question, however…you mentioned using the eggs @ room temp prevents cracking, but then you say that you use them right out of the fridge….can you clarify? If you have thin shelled eggs and are concerned about cracking, you can allow them to warm up to room temp before boiling (they will cook a little faster, too). These eggs have thick shells and I was in a hurry, plus I didn't need to have them cosmetically perfect, as for deviled eggs, so I just placed them in the water cold. Older eggs will peel easily regardless of how soon they are peeled, so if you want to keep boiled eggs around and peel them later, go for eggs that are at least two weeks old, or even up to a month or more. Store eggs are generally this age by the time you purchase them. Thanks for this post! I have recently heard of steaming the eggs in a veggie steamer, instead of boiling. It seems to work pretty well, even with my farm fresh-right from the hen-eggs. Just another way to get the same results, using less water! That’s interesting. I’ve never heard of it, but it makes sense. How long do you steam the eggs? Thanks! Been looking for ways to enjoy boiled FRESH from the hens eggs….which are hands down delicious but not so pretty. I also have so many this time of year I try to make excess into pickled eggs but the fresh eggs look terrible in the jars. I did find an egg pickling trick to poke the end of eggs with darning needles to inject pickle juice into the whole egg. 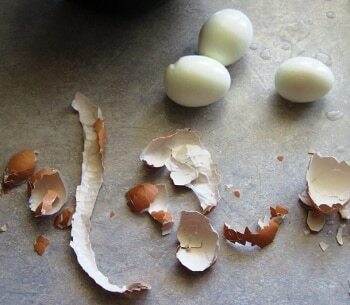 Well I’m off to test peeling the fresh boiled eggs…. Jill – thanks for letting me know about my mistakes. Fixing it right now. Whats your take on adding a teaspoon of baking powder to the water to change the consistency? Hence making them easier to peel. Also adding a teaspoon of table salt to the water to help seal up any cracks that may occur when boiling the eggs? I’ve seen baking soda recommended, but not baking powder. It’s supposed to help keep the albumen separate from the shell. Someone also recommended storing the boiled eggs in water in the fridge. I could see how this would work, because the water would move through the shell, keeping the albumen wet instead of dry and tacky.